+0 Story: Story? What story? Dr. Wily wants revenge. 'Nuff said. Wily brings back a bunch of old robot masters who failed to destroy Mega Man the first time. The story is absolutely minimal, and none of it is conveyed in-game anyhow, so—like in the original Mega Man—it's merely an excuse to blow up robots. +1 Music: Faithful (and somewhat jazzed up) recreations of the NES tunes mingle with some pleasantly catchy new compositions that successfully capture the essence of a Mega Man soundtrack. (I'd describe the music here as "optimistically heroic.") I generally prefer the original NES renditions of the music that's been adapted, but the sound here is cleaner and usually more complex, which should appeal to anyone who isn't as much of a sucker for '80s chiptunes as I am. +0 Sound Effects: Though the sound isn't identical to the NES games, everything is appropriate and not terribly obnoxious, except perhaps for the rippling screech noise the Cutting Wheel enemies make. I find the Game Boy sound effects to have a little less charm than what's heard elsewhere in the series, but I like the sheen of Time Stopper, and the techno-kitten purr of the disappearing bricks. -2 Control: I'm willing to concede that the smaller-than-usual playing field leaves relatively little time to react to the challenges, but Mega Man seems especially slow to respond, and it doesn't help that he's slippery. It's also a little awkward to use the Carry utility in midair, but maybe that's just me. -2 Stages: On paper, these challenges seem fair enough. Dodging rolling buzzsaws on conveyor belts; avoiding Octopus Batteries as you climb ladders; fighting Scworms and Sniper Joes on icy cliffsides...what makes the game so unpleasantly brutal is the incredibly unbalanced distribution of power-ups, combined with the expectation that Game Boy Mega Man is as quick and limber as his NES counterpart. Enemies drop weapon capsules galore, but health capsules are rare, and the ones you find lying around usually come before the part where you need them. Extra lives are terribly hard to come by, and it's a safe bet that you'll get yourself killed at least once or twice if you go after the couple that are specifically placed in a level. Enemies tend to be more durable and deal more damage than is appropriate for such sluggish, close-quarters fighting (Changkey Makers are particularly bad). There's a fair amount of repetition in the challenges, too (Elec Man's ladder screens come to mind), which amplifies the tedium of retrying a section after failing. Success really comes down to pure memorization of enemy placement and patterns—there's barely any room for good reflexes, clever weapon use, general platforming skill, and even dumb luck to make much of a difference. The game is as demanding as the NES games, but no concessions are made for the design limitations, and the rewards have never been so unrewarding. +0 Bosses: From MM1, we've got Ice Man and Fire Man (two of my favorites), plus Cut Man and a (thankfully) damage-rebalanced Elec Man. That's all fine; no problems there. From MM2, we've got Flash Man (another favorite), Quick Man, Bubble Man, and Heat Man—also fine. Together, though, it's a bit of overkill to have a double dose of boomerangs (Cut, Quick), fire (Fire, Heat), water (Ice, Bubble), freezing (Ice, Flash), and speed (Elec, Quick). Enker adds some interesting diversity to the mix with his ability to absorb and channel your shots, but the fight can be brutal—no special weapon vulnerabilities, no E-Tanks, and too many possible attack patterns for such little room to react to them. The final boss is an acceptable challenge, but not one I particularly enjoy; the small playing field and sluggish movement once again make things harder than they should be, and while I approve of using Mirror Buster against the second form, that stupid claw is aggravating. +0 Special Weapons: Rolling Cutter, Ice Slasher, Fire Storm, and Thunder Beam cover all the bases for a screen this small—freeze the big enemies, shield yourself against the small enemies, hit foes above and below you, and mop up everything else with a boomerang. There's not too much need for anything else—and, frankly, there's not much opportunity for anything else, considering you don't get the other five weapons until right before the final stage. And despite how versatile MM2's weapons are when matched with each other, Dr. Wily's Revenge manages to pick the most redundant weapons to accompany the ones from MM1. Time Stopper works on the same principle as Ice Slasher; Atomic Fire is fundamentally similar to Fire Storm (one fireball at a time in a straight line); Quick Boomerang is unnecessary when you have Rolling Cutter; and the level architecture doesn't provide any compelling reason to use Bubble Lead over any other weapon. These aren't bad weapons my any means, but even in the best of circumstances, they'd have a hard time not competing with each other. Mirror Buster is neat, though; deflecting projectiles is both fun and a helpful ability that isn't represented elsewhere in Mega Man's arsenal. -2 Items/Upgrades/Support Utilities: Technically, there are 1-Ups and health refills, but almost all you'll ever see are weapon refills. With so much redundancy in the weapons and so little room for error in the challenges, that's either cruel or careless. Consequently, the absence of E-Tanks stands out as a tremendous problem, especially in the boss gauntlet at the end of the unusually long penultimate stage. The only real advantage you get is Carry, a generic-looking utility that's awkward to use without a good amount of practice. The ability to place a platform underneath yourself in mid-jump is interesting (and could potentially save you from falling into spikes), but the potential is wasted by level architecture largely devoid of the kinds of platforming challenges where that would come in handy. Mostly, it's an awkward tool to grab a few power-ups. +0 Ending: Wily admits defeat, the space fortress explodes (it's a cool explosion), a jarringly normal-looking random space shuttle flies away, and roll credits. Well, not really credits. It's a scrolling starfield where all the enemies you've fought pass by your eyes, with their names listed!! Exciting. But we have no idea who made this game. Cut to Mega Man walking past some viewports before standing in front of one and staring out into space. A good ending for a game with no real plot, though the music starts out too slow and sleepy (it picks up a bit once the percussion kicks in), making the whole thing drag way more than it should. -2 Replay Value: Four stages to choose from. Four. That's only 24 different ways to play through the game. The boss gauntlet in Wily 1 hardly counts—picking which teleporter to enter first influences the flow of the game for all of two minutes, and the special weapons you gain make it POSSIBLE for the average gamer to beat the other bosses, not just EASIER, so it's not like sequence-breaking is much of an option for most people. A handful of "pursue them at your own risk" power-ups try their darndest to add replay value, but they scarcely make a dent. -2 Polish: At a glance, Dr. Wily's Revenge passes for a professionally developed Mega Man game. Upon close inspection, however, it's clear that the game is designed around completely different core mechanics than it actually has. Mega Man is sluggish and floaty, but most of the challenges (eg, the fire jets on the floor in Fire Man's stage) are fast-paced and precision-oriented. The screen size is smaller than usual, but many of the enemies (eg, Sniper Joes) are exceedingly difficult to fight in close-quarters situations, especially if you're not prepared for them when they scroll onscreen. These factors make it unusually hard to avoid taking damage, but instead of compensating with a few concessions to the player, enemies dish out enormous damage, there are hardly any health power-ups, extra lives might as well be nonexistent, and E-Tanks are on vacation until the next game. Special weapons are practically a requirement to survive, but almost half your arsenal is redundant and comes too late in the game to be useful for more than a challenge or two. Nothing about the game is tailored to fit the core game mechanics, and the core game mechanics are already rough around the edges compared with most other Mega Man games. -2 Extras/Easter Eggs: Nada. Zero. Zippo. Zilch. Unless you count hacking into the ROM to listen to the unused ending theme (which is totally better than the one they used, by the way). -1 Novelty: Aside from Carry, Enker, the final boss, and a scant handful of other inclusions (eg, the icicle puzzles in Ice Man's stage and the fact that Wily has a fortress IN SPAAAAAAAAACE), there's not much going on in the novelty department. Most of the game is remixed, rehashed, or recycled from MM1-2, and while that could be considered novel in its own way, the truth is that we've already seen and heard most of what the game has to offer, in one form or another. -1 Story: Judging strictly from what actually appears in the game, there is no story. Again. We've established that's not really a problem; what's troublesome is the incredible discontinuity of the plot as conveyed through everything from books to advertisements to different versions of the instruction manual—not a single source has the complete story, and the varying details that are given tend to raise more questions than they answer. 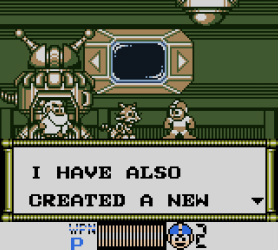 Supposedly, Dr. Wily stole a time machine and went into the future, bringing Future Mega Man back to the present and modifying him to become Quint. Don't ask for more info; "convoluted" doesn't begin to describe it. Still, none of this is expressed in-game, so it's still possible to blissfully assume that the game has no plot. +0 Graphics: There's more detail here than in Dr. Wily's Revenge, though it helps that many of the backgrounds are essentially copy/pasted from the NES games. At the same time, some sections of blandness and repetition persist, mostly where things aren't ripped from the NES games. A couple of the character designs look smooshed (eg, Mega Man's sliding sprite), dweeby (eg, Quint), or more suitable to appear in Super Mario Land (eg, the final boss), so it's a wash—better than Dr. Wily's Revenge in some parts, but decidedly not in others. -2 Music: I'm an apologist for this soundtrack, but I won't deny that it falls far short of the minimum standard for a Mega Man game. Audio quality is poor, and the notes are excessively high-pitched and unnecessarily dissonant. That's the extent of it, though—I see little validity in the complaint that the game uses an all-new soundtrack instead of recycling the music from MM2-3. Yes, everyone loves the music from those games...but the melodies here are not inherently bad. Pitched down a bit, perhaps with a different instrument set and/or a slightly different arrangement, these tunes could easily be on par with any other Mega Man tunes. As they are, it takes a very dedicated, tolerant fan to appreciate them, but it's unfair to berate the soundtrack on the basis of it having an identity of its own. +0 Sound Effects: Similar, though not identical, to what's heard in Dr. Wily's Revenge; the pitch of some sounds is just a hair lower, and there's a hint of Mario-esque cartooniness that softens the atmosphere ever so slightly. I find the sound effects here to be strangely charming, but they're not wildly better or worse than before. -1 Control: Now that Mega Man can slide and stop on a dime, movement isn't as much of a problem. He's still a tad sluggish, as is Rush Marine, but the worst of it has been resolved. Sakugarne is too bouncy to handle well, and the menu screen is a little clumsier with the addition of E-Tanks throwing off the symmetry of the list, so there's still more room for improvement. +0 Stages: Tough challenges are part of the Mega Man franchise's identity, but I'd rather have a game that's yawn-inducingly easy than a game that's difficult beyond the point of being fun. As if to make up for Dr. Wily's Revenge, MMII holds the player's hand the entire time—extra lives are plentiful, health and weapon refills are never too hard to find, platforming challenges are straightforward and easily bypassed by the Rush utilities, and enemy damage output is kept to a minimum. It may not be the most pulse-poundingly memorable Mega Man experience, but it's just fine if you need your Mega Man fix and don't feel like trying as hard to win. +1 Bosses: Air Man, Crash Man, Metal Man, Wood Man, Needle Man, Magnet Man, Hard Man, and Top Man—that's a good mix of slow and fast, projectiles and collision damage, offensive and defensive fighting...though a bit heavy on attack patterns that involve standing in place and/or moving back and forth between two main positions on the screen. Quint is no exception, plus it's hard to take him seriously when he looks like a wannabe Quick Man riding a jackhammer pogo stick designed more for entertainment than combat. +0 Special Weapons: As with Dr. Wily's Revenge, the first-round weapons are all you'll really need. A rebalanced Metal Blade is still the superstar here, but Air Shooter and Clash Bomb [sic] have their moments, and Leaf Shield is especially handy for such close-quarters fighting. The second-round weapons are nice for variety but perhaps not as much for utility. Magnet Missile and Needle Cannon fill in some of the less-critical gaps in Mega Man's arsenal, Hard Knuckle doesn't offer much, and Top Spin is generally outclassed by Leaf Shield (assuming you've got enough room to maneuver with Top Spin in the first place). Sakugarne has the potential to be fun, but it's a poor choice against armored enemies and in tight corridors, which is unfortunately all you'll find in the only stage where you can use it. And anyhow, having two weapons that require you to collide with the enemy (three, if you count Leaf Shield) is completely unnecessary. +1 Items/Upgrades/Support Utilities: E-Tanks, Rush Coil, Rush Marine, the superior MM3-style Rush Jet, and the regular assortment of standard power-ups. +1 Ending: A delightfully creepy-looking skull opens up to allow Wily to escape his space fortress in a little ship; Mega Man, piloting Rush Space, gives chase...and torpedoes him!! In outer space!! (It's not violating the First Rule of Robotics if it's technically explosive decompression that kills a human, right?) Wily's ship crash-lands on Earth, leaving behind his trademark skull-shaped mushroom cloud. Then Mega Man watches a parade of the enemies he fought, though we still have no idea who's responsible for this game. Despite being nearly identical to the ending of Dr. Wily's Revenge, there's more action and more appropriately energetic music, so I say it's an improvement. -1 Replay Value: Another improvement: we've jumped from 24 to 576 ways to play through the game, simply by adding actual stages to the second-round boss fights. That's about it, though—other than deciding whether to tackle the challenges honestly or bypass everything with Rush, there's nothing that might affect the flow of the game any more significantly than usual. -2 Polish: The whole game feels slightly, if not extremely, inconsistent with the rest of the series. Various oddities with the graphics (why is Dr. Wily so tiny!?) and sound effects seem more like mistakes and oversights than deliberate design choices, and the soundtrack can't possibly have been intended to sound like it does. I remember reading somewhere that the music is pitched so high because of a programming accident—and having heard fan remakes that lower the pitch of the soundtrack, I can absolutely believe that's true. On top of that, the disjointed and conflicting story explanations (while not part of the game itself) contribute to an unpolished product, and it's almost criminal to give us something as unique as Sakugarne and basically no place to use it. -2 Extras/Easter Eggs: Nada. Zero. Zippo. Zilch. Unless you count the glitch where you can slide into the walls above the boss teleporters once they're out of commission (which is totally fun, by the way). -1 Novelty: Although the game feels noticeably different from a typical Mega Man game (for good or for ill), it's still a mashup of two NES games (MM2 and MM3). 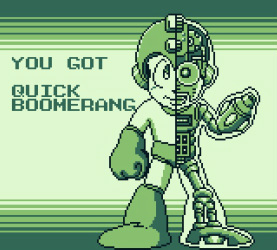 Quint, his weapon, and the final stage add some unique character; and frankly, it's novel to have a Mega Man game be this easy—but it's easy in part because the level design rarely attempts anything we haven't already seen. There's an especially strong sense of déjà vu if you play MMII right after playing Dr. Wily's Revenge, given the number of enemies making encore appearances (eg, Kaminari Goro, Mole, Pipi, Scworm, and the ubiquitous Sniper Joe). +0 Story: WHAAAAT??? NO STOOOOORRRRYYY??? Once again, nothing is explained in-game. The manual will tell you that Dr. Wily has taken control of an offshore oil platform and is drilling through the Earth's crust, with the goal of harnessing geothermal energy to power some diabolical creation (ie, It's an excuse to go blow up robots). +1 Graphics: Things look very much like their NES counterparts—most of the graphics are just a copy/paste, though the new elements inject some nice variety—and everything is nicely detailed. There's still a fair amount of repetition in the foreground and background tiles, but there's enough intricacy to keep things interesting. I especially like the dancing trees in Snake Man's stage, the steel plating in Dive Man's stage, and the dark room with the glowing bones in Skull Man's stage. +2 Music: The soundtrack is almost a direct reproduction of those from MM3 and MM4 (which are excellent), and the few new tracks sound right at home with them. Sound quality is as good as it gets on the Game Boy, and any tinniness with MM4's music has been wiped away in this installment. +1 Sound Effects: A definite improvement over the last two games, the sound effects feel more authentically Mega Man this time around. The weapons provide a satisfying "crunch" when they make contact with an enemy; tones aren't focused so much on the higher end of the spectrum; and charging the Mega Buster is the least obnoxious it's ever been, while still serving its purpose—the sound is little more than a light bubbling in the background. Nothing stands out as overly fun; but functionally, it doesn't get much better than this. +0 Control: It could be my imagination, but Mega Man seems a tad more spry than in the last two games. Even if that's not true, everything works as it's supposed to, so there's virtually nothing to complain about. As far as the Game Boy games go, this here is close to perfection, but the NES games still have them beat in terms of precision and responsiveness. -2 Stages: Nowhere else in the series does the cramped feel of the Game Boy games seem so bad. MMIII doesn't just surprise you with enemies and pile them on top of you—the game enjoys catching you off guard and putting you in horrible situations where it's impossible to dodge. You will get smacked in the face, repeatedly, if you don't let go of the control pad the moment you arrive on a new screen. 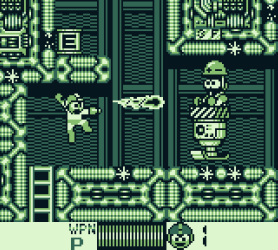 Drill Man and Dust Man's stages especially have multiple screens where you need to blindly fall down a hole and hope you don't land on anything painful. Without the right special weapons, Gemini Man's stage is an exercise in being swarmed by enemies you can barely hit. The final stage is rife with individual screens where you're double-teamed by fast or sharpshooting enemies who give you approximately one second to respond if you're not prepared for them. The challenges might be halfway fun if you had any room to breathe and weren't expected to be clairvoyant; as it stands, MMIII is one cheap shot after another, with a few unpleasantly demanding platform challenges here and there. All this overshadows the joy of playing through adapted stages from MM3 with the charge shot, exploring the majorly remodeled stages from MM4, and being ambushed by an amusingly oversized Octopus Battery (Giant Suzy, if you prefer) in the midway stage's antechamber. +2 Bosses: Three of my all-time favorites—Gemini Man, Skull Man, and Dive Man—appear alongside such solid and diverse bosses as Shadow Man, Spark Man, Snake Man, Dust Man, and Drill Man. Thematically, aesthetically, and challenge-wise, this is an excellent mix. Punk is an interesting addition to the villain pantheon, being something of a relentless bully, embracing the music-inspired heritage many other characters have, and rocking the associated look. Wily Machine looks and acts more like a regular fortress boss than the kind of final boss we've become accustomed to, but it's a satisfyingly tricky fight to master. +2 Special Weapons: The weapons here are especially good for close-quarters fighting. Gemini Laser, Shadow Blade, Search Snake, Drill Bomb, and the secondary effect of Dust Crusher are all more likely to hit something when the passageways are this narrow and the screen is this small. Skull Barrier provides invaluable protection against the game's various surprises, an improved Dive Missile wastes no time in seeking out its targets, and a modified Spark Shock acts just like the infinitely more useful Ice Slasher. Screw Crusher introduces a unique attack pattern to Mega Man's arsenal that's great against enemies immediately above and far below. The challenges are still miserable, but at least it's not because you're at a tactical disadvantage. +1 Items/Upgrades/Support Utilities: E-Tanks, Rush Coil, Rush Jet, Flip-Top/Eddie, and all the usual power-ups. +1 Ending: Wily's big contraption explodes, Mega Man teleports away, Wily's ocean fortress explodes, Wily's smoking spaceship rises from the water...and then drops back into it, with that trademark skull-shaped splooshy kaboom. (Which then proceeds to shed a tear! Cute.) Yet another slow victory march plays (seriously, what is it with the Game Boy games and their slow victory marches? ), and enemies scroll by as an awkwardly large-headed Mega Man walks in place. At the end, we find that Mega Man has arrived at the edge of a cliff, which overlooks a lovely city and its environs. Then stars randomly start diagonally shooting past, as the player is thanked for playing. Sufficiently satisfying (especially with no stated plot to resolve), with a hint of humor. -1 Replay Value: Nothing much has changed since the last game. There are a few (very minor) optional detours for power-ups, a handful of places (almost entirely in Dust Man's stage) where you can choose to fall left or right onto the next screen, and that's about it. +0 Polish: Retooling the charge shot sound effect to be less obtrusive is a nice touch, but otherwise, not much stands out one way or another. I'm tempted to dock the game for all the times you can get blindsided by enemies when entering a new screen, but that's arguably deliberate and not sloppy game design. -2 Extras/Easter Eggs: You'll get nothing and like it. +0 Novelty: On the one hand, MMIII has all the foes and stage hazards you remember from MM3-4, a soundtrack that's almost completely recycled with scarcely any hint of remixing, and essentially the same ending and lack of plot as the last two games. On the other hand, many of the foreground and background graphics are new; the stages from MM4 are very noticeably revamped; and Punk, Screw Crusher, and the final boss fight are all at least modestly novel. It all balances out. +1 Story: The city is under attack! You know what that means—yet another excuse to go blow up robots. However! This time, the game is loaded with cutscenes, which flesh out the straightforward plot and establish an excellent sense of story progression and atmosphere. The manual adds that Wily's mind control device is to blame for disrupting the World Robot Exposition and sending these 'bots on a rampage; a little more elaboration like this in-game would've been wonderful, along with some dialogue somewhere to establish Ballade's character up front. +2 Graphics: Relatively little is directly ripped from MM4-5, but everything looks just as nice—big new enemies, sparkling backgrounds, animated cutscenes, even generic foreground objects are eye-catching and impressively detailed. The backgrounds could stand to have a little more variety, and the overall aesthetic of some stages isn't as appealing to me as what's found in other Mega Man games (though I suspect the lack of color has a lot to do with it), but those are trivial complaints when everything looks this good. +2 Music: Plenty of energy here, and the barely altered NES tunes still sound good. I'm especially fond of the stage select themes, the game over theme (not that I've ever heard it, pfft), and pretty much anything you hear in the Wily stages. +2 Sound Effects: A good variety of bloops and blips (as opposed to blips and bleeps) gives the audio some character. Everything fits, and I'm especially fond of the swirly noise that happens when you're absorbing a defeated boss's power; it reminds me of the intro to the battle theme in Dragon Warrior. -1 Control: Essentially the same as in the last installment, but now your charge shot carries some knockback. Conceptually, it's perfectly sensible for a larger buster shot to have some kickback; in practice, it's a little jarring to be pushed back while making a precise jump, or have your jump canceled altogether when trying to immediately transition from firing to jumping. It's by no means game-breaking, but it's subtle enough that (if you play like I do) you'll unexpectedly end up in a bottomless pit more than once. Shop navigation is adequate, but the password screen is fairly awkward to navigate (though that's just as much a matter of visual design as it is the controls—give me letters or pictures; don't make me switch between the two). -1 Stages: Level design is strangely inconsistent. Individual challenges tend to be creative and satisfying, and I'm particularly impressed with how the game uses so many rising/falling platforms without the gimmick ever feeling stale. There's a mild puzzle aspect to many of the challenges (see: Napalm Man's stage), which I appreciate. Challenges are generally fair and well designed, though a few challenges could stand to be introduced better (eg, the sinking platform challenge in Bright Man's stage), and the "tricky platforming due solely to crowded architecture" trope starts to wear thin here. The big issue is that most levels start to drag after a while. Screen counts are significantly larger than usual, and Crystal Man's stage in particular is outrageously long—about 60% longer than average, with multiple paths...and unacceptably limited and terrible checkpoint placement. I docked this category a point for that stage alone. Level length is inflated by recycled geography (three major sections of Charge Man's stage are absolutely identical, save for the arrangement of enemies) and by multiple screens where it feels like the developers planned a challenge but forgot to implement it. Moreover, there's hardly any blending of the two source games; the giant hippo miniboss in Stone Man's stage stands out as the only significant crossover from another stage, let alone another game. After riding around Elec Man's stage in cloud chariots from MM2, navigating Wood Man's stage with Rush Marine, and fighting Hammer Joes in Drill Man's stage, this comes off as something of a disappointment. +1 Bosses: Though most of my favorite MM4 bosses were used in MMIII, and Charge Man's still kind of a jerk, there's a nice blend of combat styles and visual designs here: Toad Man, Bright Man, Pharaoh Man, Ring Man, Crystal Man, Napalm Man, Stone Man, and the aforementioned Charge Man collectively have the player frantically dodging projectiles, being alert for imminent collision damage, watching carefully for attacks that affect the whole screen, and holding out for a window of opportunity to inflict damage. The impact of the decreased boss chamber size is felt especially strongly in this installment; these robot masters are particularly mobile and trigger-happy—unpredictably so at times—making close-range combat even more of a liability than in the previous Game Boy games. At the same time, this injects a bit more freshness into the boss fights for seasoned veterans, who are probably so used to fighting Toad Man at a distance that they forget what it's like to be sat on by him. Ballade (in both of his forms) offers a solid challenge and sports a slick look that adds some coolness to a lineup that includes a dancing frog, an angry choo-choo train, and a dude with a lightbulb hat. The multi-part final boss presents a series of straightforward but hectic challenges; I think I like the scrolling capsule fight, but needing to rely on the limited ammo of a special weapon and being able to die instantly is perhaps more stressful than necessary. +2 Special Weapons: A well-rounded assortment with a little bit of screen-wiping (Rain Flush), multidirectionality (Power Stone, Pharaoh Shot, the slighly redundant Ballade Cracker), close-quarters effectiveness (Charge Kick), game mechanics alteration (Flash Stopper), boomeranging (Ring Boomerang), scattering projectiles (Crystal Eye), ground-following (Napalm Bomb), and homing (Beat). I'm tickled that Rain Flush has the added effect of putting out fires and solidifying quicksand, and that Ring Boomerang can be used to snag items from a distance. +2 Items/Upgrades/Support Utilities: The ubiquitous Rush Coil and Rush Jet are joined by E-Tanks and the usual assortment of power-ups we all know and love. W-Tanks and S-Tanks can be purchased from the lab with P-Chips, the precursor to screws and bolts. Mini E-Tanks can be found and purchased as well—collect four to create a full-size E-Tank. While seasoned players might max out on regular E-Tanks before the mini ones ever become relevant, the idea is not an unwelcome one. The Energy Balancer is available for purchase, BEAT letters are scattered throughout the first four stages, and WILY letters hide out in the next set of four. Lastly, you can pay Dr. Light to refill your weapon energy between stages, as it doesn't happen automatically, so that's useful. +1 Ending: An escape sequence! Excellent. The ship is shaking, an alarm is blaring, and Mega Man blasts through one emergency barrier after another as they keep trying to seal off the hallway. Our hero soon reaches the last wall between him and safety...but he can't break it! (Where's Proto Man when you need him...?) Desperately firing at the wall with all his might (and not trying his special weapons, I might add...), things begin to look desperate. Suddenly, a heavily damaged Ballade appears; following a brief exchange where he apologizes for his actions, he sacrifices himself to blow a hole in the wall. Mega Man, along with a bunch of random junk, is sucked out into space. Whooooooo! Wily's spaceship fortress luxury cruise liner thingy explodes as Mega Man and Rush look on, and then...things get less exciting. A disappointingly slow rendition of the end credits theme from MM2 and MM4 begins to play as we see a montage of Mega Man fighting the eight robot masters for about 20 seconds each—which might not seem like a long time, but the player just finished toasting these clowns for a second time about 10 minutes ago. This might be excused if Mega Man were shown fighting the bosses with expert skill...but it looks like one of the developers recorded a single casual attempt. Once all the fighting is over, the scene fades to a somewhat unremarkable view of mountains and a sunset, with the occasional shooting star overhead and Mega Man staring off into the distance. The obligatory slow victory march plays. Overall, the first half of the ending is pretty cool; the second half—like the stages—ends up feeling longer than necessary. +0 Replay Value: The basic "two groups of four bosses" structure is still holding the replay value back, but there's a long alternate path in Crystal Man's stage to help make up for that, along with a number of branching dead-end paths leading to optional power-ups throughout the game. An optional scavenger hunt for the BEAT letters also boosts the replay value, but the search for the WILY letters is less meaningful because you must collect them all in order to finish the game. +1 Polish: The kickback when firing a charge shot is a neat touch (albeit a tricky one), and I like that we get to see more detailed robot master close-ups and a sample of the level geography on the stage select screen, but there's some serious slowdown in a few parts. +1 Extras/Easter Eggs: Not counting all the hidden power-ups, there's only one secret I'm aware of, but it's an excellent one: If you Game Over enough times, Dr. Light will take pity on you and upgrade your Mega Buster. Take that, Easy Mode; this game makes you earn your handouts. +1 Novelty: Most of what I said about MMIII applies here—recycled music and enemies; new graphics and endgame material. By and large, the robot master stages feel more like their NES counterparts than in any other Game Boy installment, but a handful of major redesigns and a good number of new level hazards tend to balance out the familiar. MMIV marks the first appearance of the shop, and it's different to have so many cutscenes and branching dead-end paths. Top it all off with a couple new enemies/bosses who aren't the Mega Man Killer or final boss, and that's enough to qualify as novel. +2 Story: Robots FROM SPAAAAAAAAACE have invaded Earth, and Mega Man's weapons are useless against them! Dr. Light quickly whips up a weapon that'll pierce the aliens' armor, and our hero sets out to conquer the Stardroids before they conquer the planet. We meet their leader, the leonine Terra, and Sunstar, the ancient cosmic destroyer. Dr. Wily is, of course, meddling with the situation behind the scenes, but he finds himself in over his head as he discovers the true power of these machines. There's a wonderful sense of scope and perspective that's missing from most other Mega Man games; the danger these Stardroids pose to the world is tangible, there's a clear sense that there's more to the universe than the scuffles between Mega Man and Dr. Wily, and it's great to see Dr. Wily on the defensive for a change. Seriously, MM8 should've used this space robot plot instead—those cutscenes would've been awesome. +2 Graphics: Good-lookin' mugshots, intricate backgrounds, fun enemy designs, and cool weapons make up for stylistic repetition in the stage design—Mars, Mercury, and Venus all seem to reside in a generic Wily stage, while Uranus, Pluto, and Saturn are all about decorating with rocks and bricks (and the gravity arrows in Saturn's stage look a little ugly and haphazardly tiled). Super Game Boy optimization helps a bit, too; those extra colors are nice. -1 Music: Something feels off about the music; it's not bad, but it's not as Mega Man as usual. The tunes are complex, but highly melody-driven; the percussion line is often very repetitive or understated, and the secondary instruments are frequently relegated to circular "doodle-oodle-oodle"s (that's the musical term for them). Most of the melodies strike me as a little anemic, and sometimes the tunes are too complex for their own good—there are times when notes start going all over the place across most or all of the instruments, and it's difficult to tell what exactly you're supposed to be humming along to. A few of the tracks are catchy, and a few of them are just as strong as anything you'd find in the other Game Boy games, but for the most part--especially with the strainingly slow intro and ending music—the soundtrack isn't up to par. +1 Sound Effects: Tango's meow. The hollow echo of opening the menu screen. The accordion-esque sound of absorbing a defeated boss's power. Tango's meow. (Seriously cute. But then, I am a cat person.) There are a few fun and cool sounds that stand out, but the rest are fairly unremarkable. That's not to say they're bad—the machine gun typewriter text works well, and the screeching energy of the Wily Star's laser beams is highly appropriate, for example—but they get the job done, and that's about the end of it. The boop of Bubble Bomb seems like a placeholder for the real sound effect, though. +1 Control: Mega Man handles well; the only noticeably floaty moments for me occur when trying to hop onto Rush Coil (subsequently gliding past him). Similar to (but far less disruptive than) the recoil of the Mega Buster in MMIV, there's a variable delay between firing a charged Mega Arm shot and being able to shoot again, which might throw you off slightly. Another inconsistency is with the buster upgrade that allows you to grab onto enemies and deal continuous damage—it often feels like the upgrade functions only when it wants to. The password screen hasn't really improved, but the shop is about as streamlined as it gets (which still isn't saying much). Rush Space control is a little loose, but there's not really much need for precision in that section anyhow, and the rocket boost is lots of fun. +2 Challenges: Diverse, creative, and fair challenges make for a satisfying platforming experience, and it's a joy to see a few underdeveloped ideas from previous games live up to more of their potential here—Pharaoh Man, Gravity Man, and MM3's third Wily stage would be proud (or possibly jealous). Granted, Jupiter and to a lesser extent Wily Star have some areas where the challenges get a little repetitive (enough with the Biribaree enemies already, Jupiter...), but they mostly stand out because of how well-crafted the rest of the game is. Waterfalls rush onto the screen, temporarily washing away platforms and ladders; the ground rises and falls in a fight against a weaving helicopter miniboss; items are tantalizingly placed on the other side of some spikes that look easy to slide under; there are even rematches against Enker, Quint, Punk, and Ballade in one of the most insanely boss-heavy stages in Mega Man history. Interesting stage hazards abound, and the interplay between the level geography and varied enemy types provides some solid challenges (though the developers do get a little spike-happy at times). Throw in a few secret passageways and a cleverly integrated space shooter section, and you've got a game that deftly challenges the player on multiple levels (no pun intended). +2 Robot Masters: First of all, the planetary theme of the bosses in this game is clever; it's refreshing to fight against a unified band of baddies rather than the random assortment of robots we usually see. Second of all, the bad guys have plenty of character: the Stardroids come in all shapes and sizes (and colors, if you consider the official artwork)—though a few designs are suspiciously reminiscent of previous bosses—and their attack patterns and abilities challenge the player to approach each battle in a truly unique way. Mercury has a predictable pattern but the awesomely evil audacity to steal your items if you get hit; Venus is the explosive missing link between Toad Man and Bubble Crab; Mars is Napalm Man MKII; Neptune is Wave Man with aspirations of Toxic Seahorse; Jupiter is the kind of ceiling-hugging electricity boss Sheep Man should have been; Saturn is like Ring Man's taller, less specialized brother; Uranus is Hyper Storm H after a good workout digging tunnels; Pluto is a kinder, fuzzier Slash Man; and Terra is David Bowie with his own portable laser light show. Okay, so a lot of these guys look and fight like other bosses in the series (a few of which, admittedly, weren't introduced until after this game was released). Repetition of ideas is nothing new for the Mega Man series. What counts is that, individually and collectively, these boss designs are thoughtful and particularly well-rounded. +0 Special Weapons: Like MM3, there are too many weapons that fire forward in a straight line, but the damage output and secondary effects of these weapons tend to balance out the somewhat limiting attack patterns. Electric Shock is powerful, but has a painfully short range and completely immobilizes you; Grab Buster is a brilliant innovation that's just as good for dealing damage as recovering from it; Bubble Bomb's explosion radius helps to make up for its somewhat odd attack pattern, and it's very useful as a sort of upside-down Search Snake; it's difficult to time Photon Missile to hit anything that isn't right in front of you or completely stationary (and by the time your projectiles connect, you could've used another weapon to dispatch your enemy); Salt Water's literal splash damage is great for folks with poor aim, and its varying trajectories make it a more versatile weapon; Black Hole is probably excellent, being able to momentarily halt your momentum and hit pretty much anything on the screen, but I've somehow barely used it; Deep Digger is mostly an encore of Super Arm, but the blocks you throw are smaller and only split apart when they hit a wall, so it's far more useful for clearing paths than attacking; Break Dash is awkward to master, on account of the need to charge it up, but the invincibility it affords is nice; Spark Chaser is a little unpredictable about how long it will take to hit an enemy, but the damage and accuracy are good; and Tango is effective against a few obnoxious enemies and works well as a sidekick when things get too hectic. When you land a hit, these weapons are great, but landing a hit in the first place is sometimes a little more of a challenge than it should be. +2 Items/Upgrades/Support Utilities: Start with everything we had in MMIV save for the letters, add Rush Space (it's Rush Marine IN SPAAAAAAAAACE! ), throw in two grabber upgrades to the Mega Arm (one that grabs and retrieves items, and one that grabs enemies to do damage), and hide mysterious crystals in the second set of Stardroid stages (which Dr. Light uses to create an item that cuts your weapon energy use in half), and you're pretty much maxed out on awesome. +2 Ending: Sunstar, heavily damaged, breaks off his attack. Mega Man offers to bring him back to the lab for repairs (after MM7, I'm sure Dr. Light will start discouraging Mega Man from doing this), and Sunstar questions his offer. They take a moment to exchange philosophies about the nature of robots, but Sunstar concludes he is beyond help—his fusion reactor is going critical and he's about to explode. Mega Man and Rush make a hasty escape (I love the sensation of speed as Rush takes off), Wily Star explodes spectacularly, and then we get YET ANOTHER PLODDING VICTORY MARCH as Mega Man sits contemplatively in the grass, with the various Stardroids flashing by underneath him. His reverie is interrupted by a laser beam, and we find Dr. Wily, who curses Mega Man from inside his hardly spaceworthy spaceship. Just as he vows to finish Mega Man once and for all, the ship falls apart and he lands face-first on the ground, assuming the groveling position almost immediately. Coming to his senses a moment later, he runs away, and Mega Man gives chase. Cut to the traditional "THANK YOU FOR PLAYING" screen, this time with a lovely picture of Earth in the middle. Despite my perpetual complaint about the ending music in the Game Boy games, and the continued lack of staff credits, the pacing here is great, there's some character development, and everything gets wrapped up nicely. +1 Replay Value: Mystery crystals and more multiple paths than we've seen in the Game Boy games go a long way toward making up for the separation of bosses into two groups. Having branching hallways in the Wily stage is especially welcome, as most Mega Man games give you freedom of choice until the Wily stages, at which point you're on rails until the end. +2 Polish: The game plays smoothly, the developers remembered to keep the Mega Buster kickback from MMIV in the intro cutscene, the zoom-out when fighting Skull Blazer is a smart choice, and everything just works. +1 Extras/Easter Eggs: Like MMIV, there's a pity upgrade (actually, two pity upgrades!) if you lose enough, and being able to drop Uranus into a bottomless pit with some clever Deep Diggering is priceless. +2 Novelty: Stardroids instead of traditional robot masters? A new primary weapon and some cool upgrades we've never seen before? Several enemies, bosses, and special weapons with genuinely unique attack patterns? A whole level spent flying around in Rush Space? Super Game Boy compatibility? And Dr. Wily isn't the final boss? Dang, we're gonna get spoiled if they keep this up.